US demand for wood preservatives is forecast to rise 6.6 percent yearly to $860 million in 2020. A modest demand for preservatives will be seen in the railway products industry, as a great deal of preservative is used on each railway tie. Copper-based wood preservatives will see more rapid growth than non-copper-based products. Micronized copper azole will benefit most of all from changes made to American Wood Protection Association (AWPA) standards. 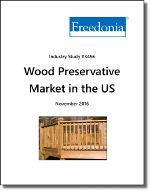 This study analyzes the US market for wood preservatives. Historical data are presented for 2005, 2010, and 2015, plus forecasts for 2020 and 2025 by product (e.g., creosote, chromated copper arsenate, micronized copper azole, etc. ), application (e.g., decking, railway products, utnilities, marine pilings, etc.) and market ( building construction, residential construction, nonresidental construction, nonresidential construction) This study also describes the industry structure and presents competitive analysis on in participants including Huntsman Corporation, KMG Chemicals Incorporated, Koppers Holdings, Lonza Group, Nisus Corporation, Rio Tinto Group, and Stella-Jones Incorporated.